I found these on flipkart the other day! Aren't they cool? 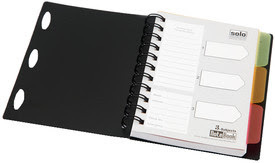 Just one diary with all your different data compartmentalized separately by those colored tags! Anyway, Solo office supplies are usually good quality. 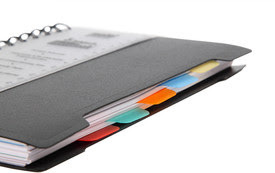 I have used their ring binders, certificate folders and expansion files. Their plastic covers don't turn brittle with use, unlike some other brands that start cracking up. And it's easy to clean them too... just wipe the plastic with a damp cloth. Their notebooks should also be great. This is my 28th post for 2013 April Spring Cleaning Challenge. Link to the previous post: "Silly Saturday: Dating a Writer?" Solo notebooks are alright, decent paper and sturdy binding. 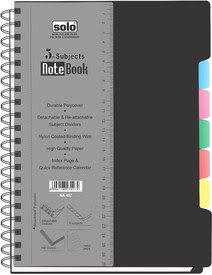 My only gripe is that these multi-subject notebooks tend to be bulky. They take up considerable table-top real estate for what is just a rough jotting pad. A6 size should be okay though, it's just about 6 inches by 5 inches. Btw, why are u commenting as anon? I was born brilliant, child. Accept that and life will be so much simpler.